Along with Red Rock and Coffeeville, Calloway is one of Upshur County's earliest communities. Settled in the early 1850s, the town grew alongside the Jefferson Road. Prior to the Civil War, Calloway became a shipping center for plantations in western Upshur County. 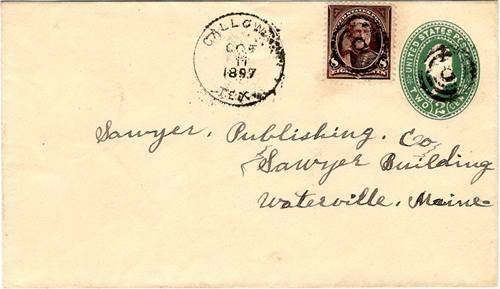 In 1855 a post office was granted. Calloway continued to grow after the war, with most essential businesses. Early population figures aren't available, but in the mid 1880s, it had an estimated population of 250. The 1890 census was nearing 300 and midway through that decade, the community peaked at that number. A decline set in around 1900 and as people moved away, the post office closed its doors. The town was dropped from most maps by the 1930s.